Ahhh Fall. The crisp air, the changing foliage, the emerging of sweaters and boots from the back of the closet, the warm apple cider, and the integration of pumpkin spice into every consumable good possible. At least that’s how my autumns were growing up in New England. In New Orleans, fall comes on a little differently. The weather stays hot and humid, the trees stay lush and green, people continue to wear shorts and crop tops, all drinks are chilled to cool you down, but at least pumpkin spice is still everywhere you look! That’s what I love about food trends, they are the great equalizer of all the very different regions of the country! Yes, fall is here, and no matter what that may look like for you, I’m betting money that you have seen at least one pumpkin flavored item marketed at your face. So, who am I to buck a trend? 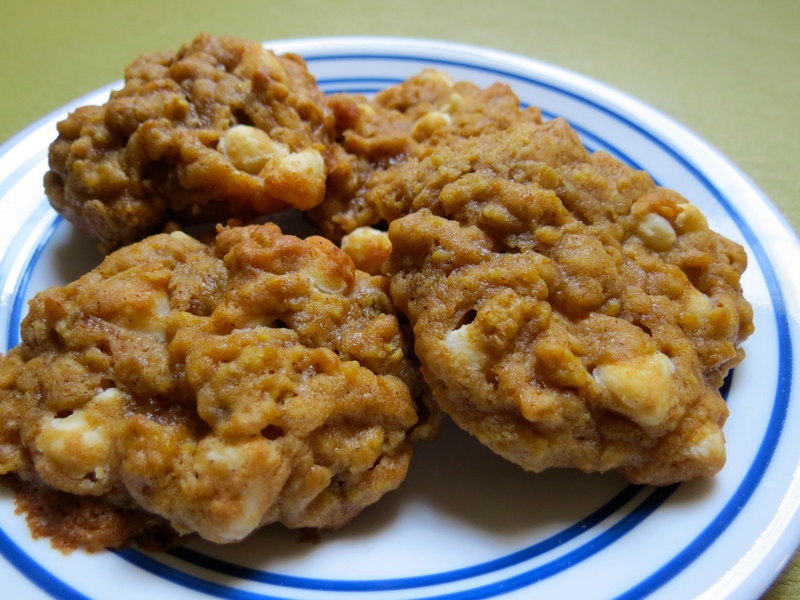 That’s why today I have for you all my DELICIOUS White chocolate pumpkin oatmeal cookies! I am particularly proud of these cookies because this is my first recipe that I have developed completely on my own. I did not follow someone else’s recipe nor did I tweak a previously written recipe. I took the knowledge that I’ve accumulated thus far in baking and I designed my very own cookie! The best part? They were a total success! Everyone really seemed to enjoy them and I must humbly say, they were very delicious. Well how could they not be? 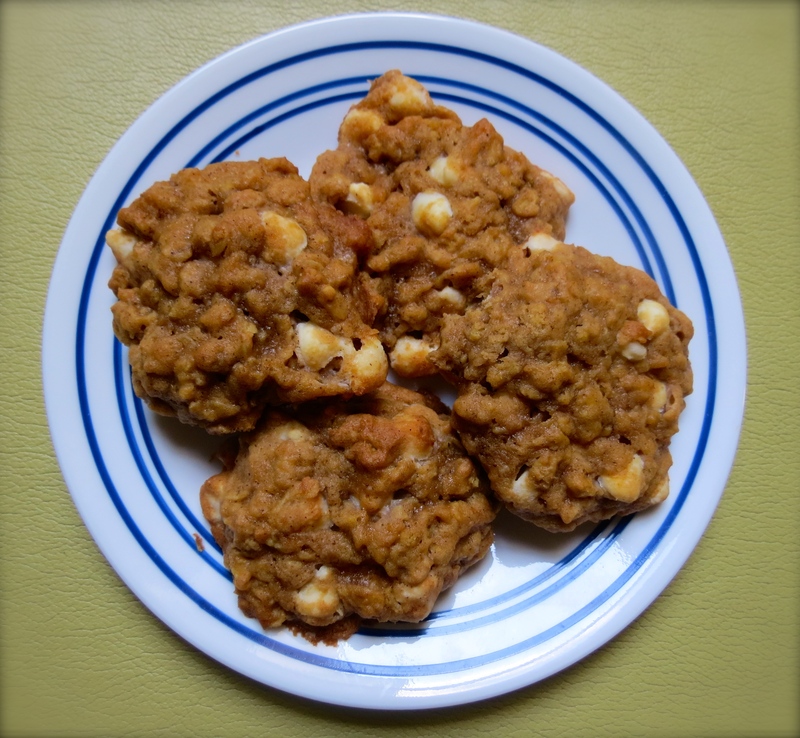 They were a beautiful combination of white chocolate and pumpkin in an oatmeal cookie base. The only notes I have on the recipe is that the dough is a little bit oily because of the pumpkin, so make sure that when you’re forming them to put on the pan you construct them extra carefully into balls. Otherwise they melt out a little bit before they hit the oven and bake oddly. This happened to about 5 of my cookies before I figured out that I needed to take more care in shaping them. Also, take the time to let them cool and firm up a little bit. I was too anxious to wait and ate 3 straight out of the oven, but the ones I had the next day were much better. So try your best to be patient! !